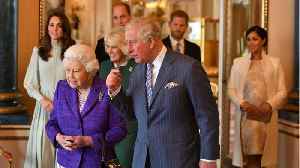 Kate, 37, wears the £1,750 polka dot midi by London-based designer Alessendra Rich in a newly released photo of her with Prince Charles, 69, and six-month-old son Prince Louis. Kate Middleton and Meghan Markle have established influential yet totally different royal wardrobes. Both of their personal styles were on display as they attended their first event of the year..
To shield herself from Ireland's chilly temps, Middleton bundled up in a bright red double-breasted coat dress by Carolina Herrera. The tailored number was paired with black tights and lace-up LK..